Iceland, the land of ice and fire, has become a pretty huge deal lately. This isolated Scandinavian nation was an “off the radar” destination for a while, but has recently seen explosive growth. Lately it seems like everybody is traveling here- and for good reason! I traveled to Iceland for a ten day road trip with my husband in August of 2016. The lack of traffic and easily navigable roads make this an ideal place to explore by car. You can follow your own pace, and see sights the big tour buses won’t make it to. DAY 1: Arrive to Iceland’s capital city of Reykjavík. Pick up rental car at the airport, and drive to the city center. Explore on foot, and see City Hall, Parliament, and Tjörnin Lake. Next, visit the National Museum of Iceland. From there, drive to the modern church of Hallgrímskirja. Pay to go to the top of the tower and enjoy scenic views! Finally, we went to a lock box with “Iceland Camping Equipment Rentals” to pick up the camping equipment we had rented and load it into our car. This was so convenient because flying from the US with these items wouldn’t have been practical. Lodging: Igdlo Guesthouse – Small house with a nice location and quiet surroundings. 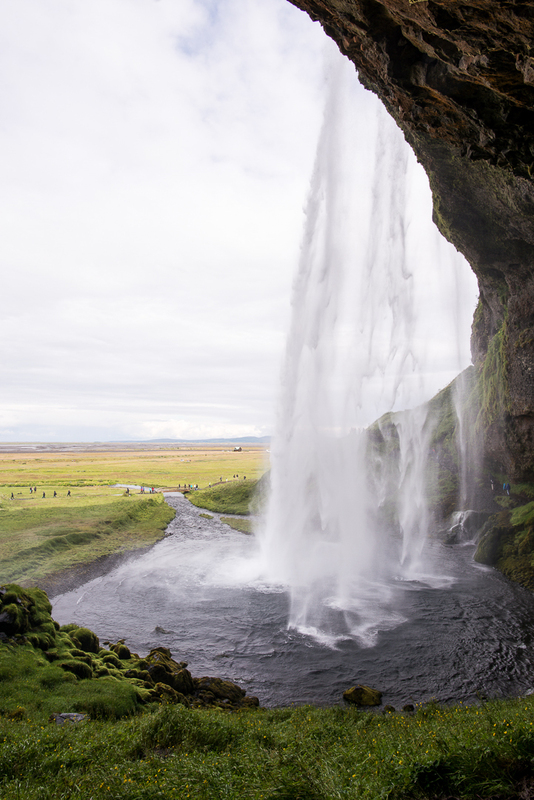 DAY 2: Drive to the town of Hella, then go on to Seljalandsfoss Waterfall. Walk across a broad field to find it nestled in a hillside, and then follow the trail to go up behind it. 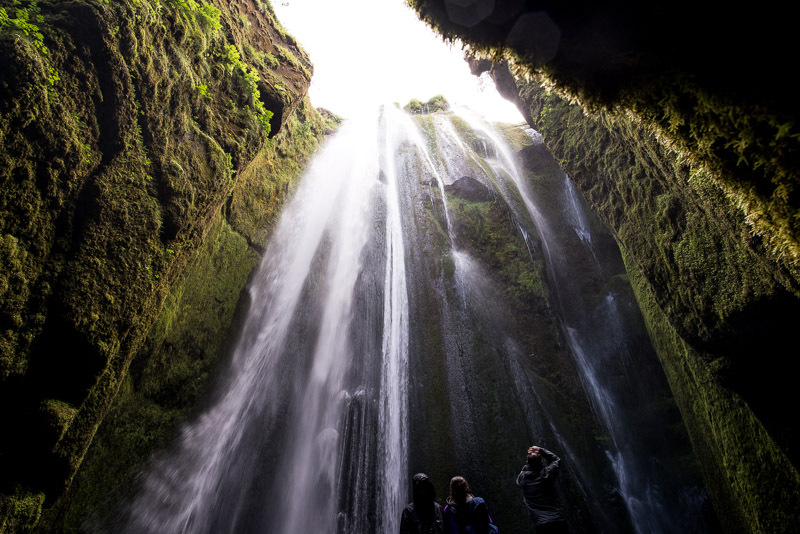 While there, also visit Gljúfrabúl, a waterfall inside of a cave. 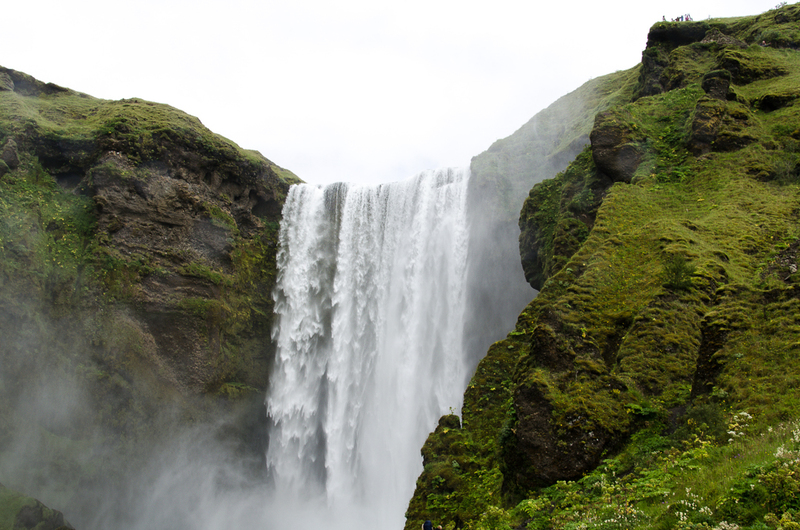 Next, head to Iceland’s most famous waterfall: Skógafoss. You can hike up to the top of the falls for an epic (and misty!) view. Now it’s time for a visit to a “secret” volcanic heated pool called Seljavallalaug. Popular among locals, the hike to the pool is about 20 minutes, and has a changing room at the top. The water is in a concrete basin next to the hillside, and is naturally heated from the underground thermal activity. Drive on to see Sólheimajökull Glacier. The pristine white ice is blackened from volcanic ash, and while signs tell you not to touch it or get too close, everybody does anyways. Continue on to Dyhórlaey, a scenic cliff-side area with a lighthouse centerpiece. From the top, you can see a view of some rocks forming natural archways. Next up is the black sand beach of Reynisfjara. Here you can see the uniquely shaped basalt columns that attract so many visitors. 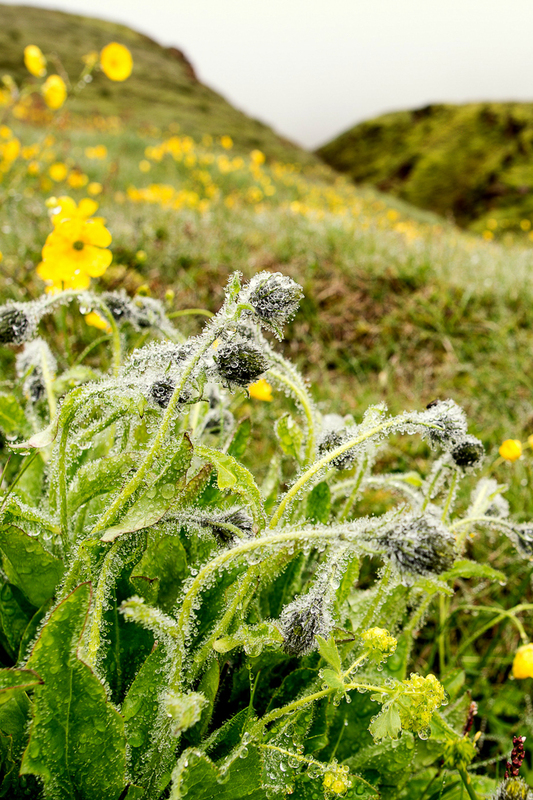 Carry on to the town of Vík, a place where an ice-cream sundae can cost $15. We made the mistake of dining out, but the prices are outrageous so I don’t recommend this! DAY 3: First on the itinerary today is Fjaðrárgljúfur Canyon. This was one of the most beautiful places I have seen in all my life! I’d never heard of it, and it was a hugely pleasant surprise! It’s a short hike, and even in the rain it was absolutely stunning. Drive on to the town of Kirkjubaejarklaustur (best name ever! ), and get some hot chocolate! Then, if you want, visit the underwhelming site of Kirkjugólf. 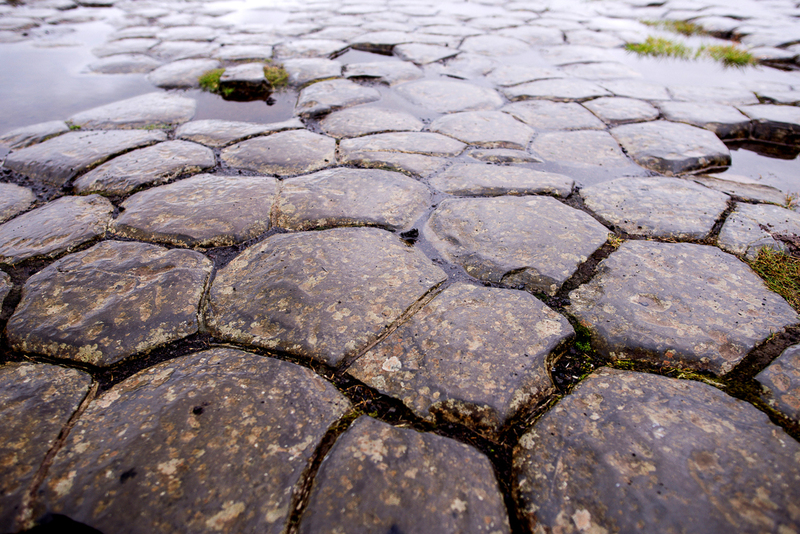 This is a natural basalt rock formation that looks like a man-made church floor. 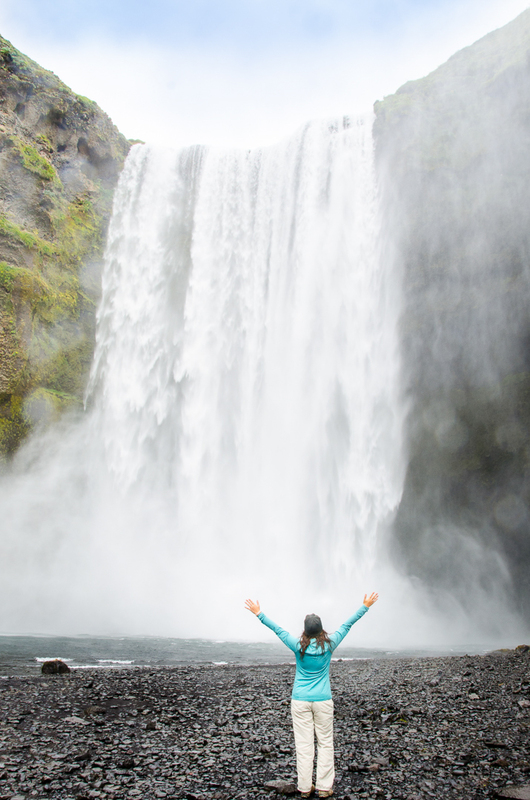 If you are in good shape or an avid hiker, continue on from Svartifoss to hike Kristínartindar Mountain. 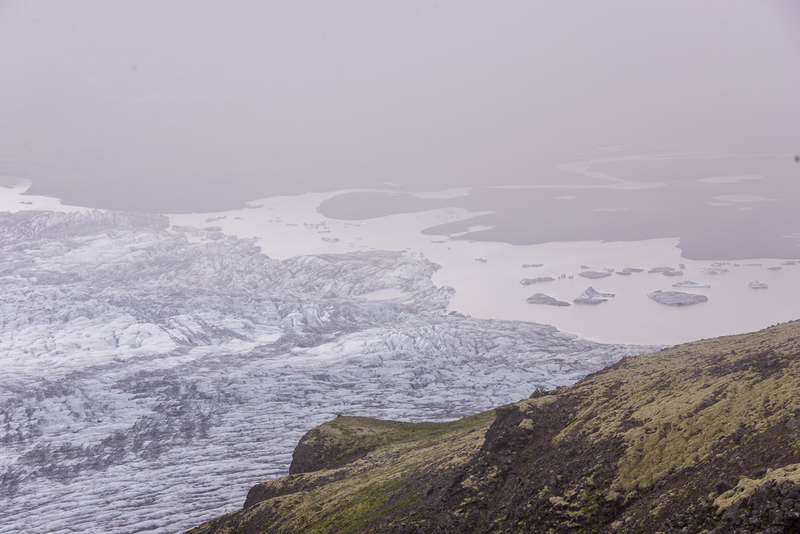 A round-trip hike will be about 4-6 hours, and a clear day will get you a view of the Vatnajökull ice cap. If you’re like me, you will let your husband hike this without you, and go take a nap in the car while you wait 😉 Check out the views while on the hike below! From there, we decided to skip the visitor center campsite, and went off-road a bit. We found an awesome spot near a glacial lagoon to set up our tent, and fell asleep to the sound of seals! 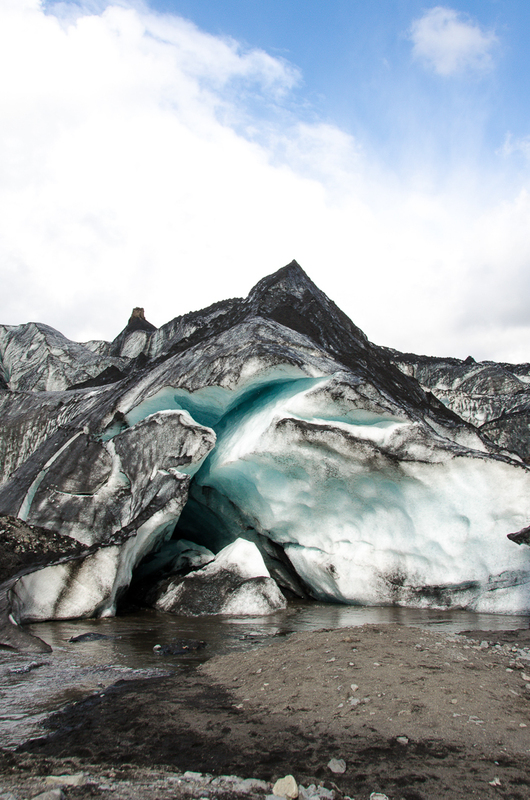 DAY 4: Enter Vatnajökull National Park again, and visit the glacier area of Skaftafell. 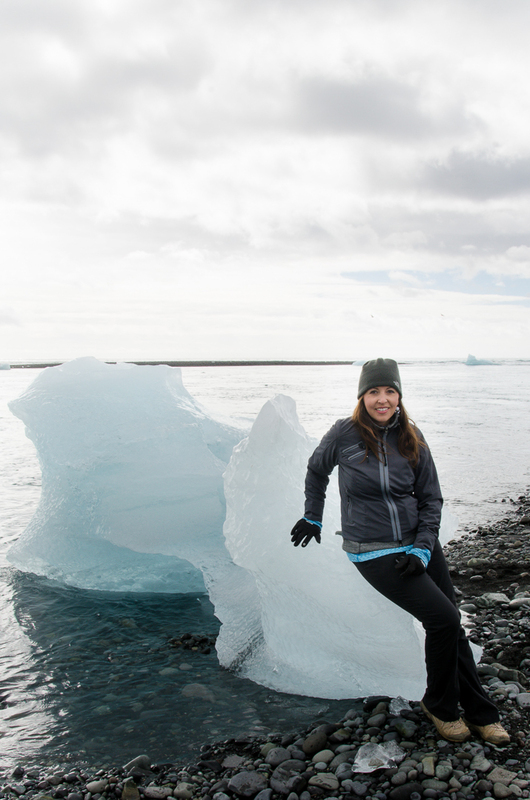 See a plethora of seals, and watch icebergs rapidly flow through the pristine blue water towards the lagoon. 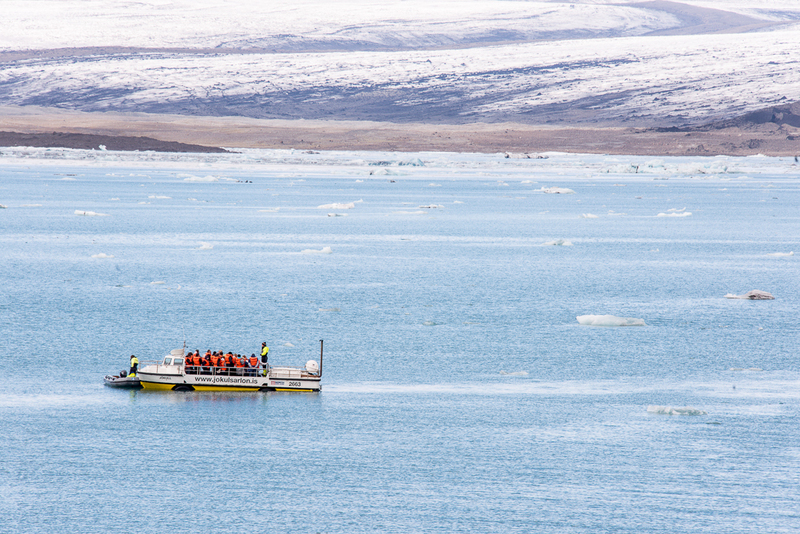 You could sit on the bridge overlooking the lagoon for hours, watching as the icebergs crack off and move. 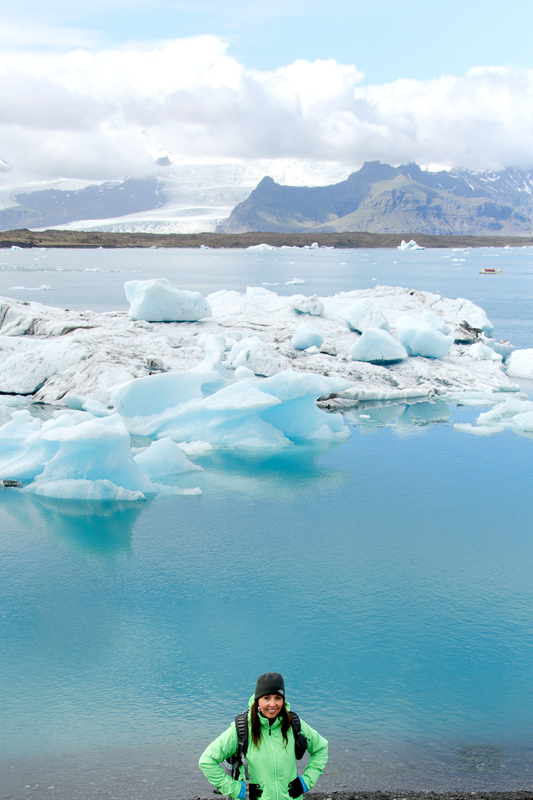 Next, be sure to take an amphibian boat tour ($43/person) of the Jökulsárlón Glacial Lagoon. Book ahead of time, as they often sell out! We had to wait two hours for our departure time, but there was plenty to see in the interim. The ride on the boat itself was fun, although very wet (it rained) and cold. 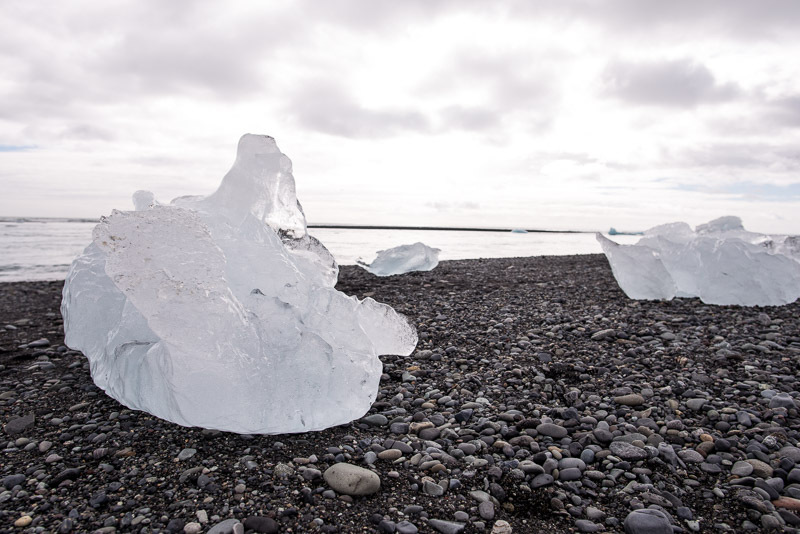 From the park, head to Diamond Beach (Breiðamerkursandur), a surreal place where large chunks of glacial ice litter the shore in stunning formations. Next, drive on to Höfn, a town that welcomes you with a narwhal statue! 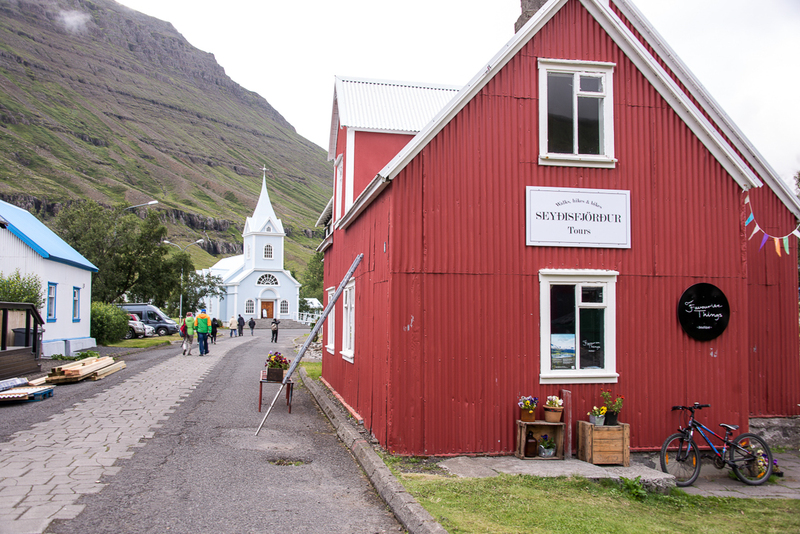 Grab lunch at the restaurant of Hafnarbúðin, and take the opportunity to try some langoustine! Afterwards, drive by Hvalnes for a quick mountain view. Stop next at Djúpivogur, a very small hillside town. This town was super quiet, and besides a souvenir shop and a strange egg exhibit, there isn’t much going on there. 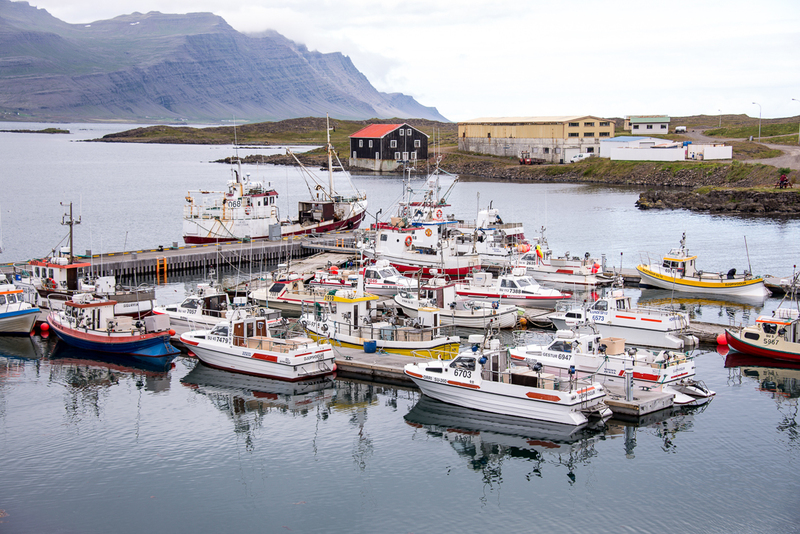 Make your way next to the artsy east-coast fishing town of Seyðisfjörður. It’s a very colorful town, with a few nice restaurants (expensive of course) that serve horse meat. This wasn’t our style, so we ate at Skaftafell Bistro, a cozy place with pizza and board games. The public campsite there was too crowded for our liking, so we explored a bit and set up our tent in a meadow full of lilacs, and strangely surrounded by trees (I say strangely because Iceland has almost no trees anywhere!). Lodging: Camping in a field near Seyðisfjörður. “Wild Camping” in Iceland is legal anywhere that is not marked as private property. DAY 5: The first stop today is Dettifoss Waterfall. Walk down a small trail, and you will end up at the top of the falls looking down. You can get quite close to the ledge, so be careful! Also FYI, this place is EPIC! Don’t worry- there was another hidden ledge below! Drive on next to the horseshoe shaped Canyon of Ásbyrgi natural area. Then, Húsavík town is the next stop! We had booked a whale watching tour with the company Gentle Giants in advance, and so had time to explore town before our boat left. We walked around the wharf and marina, layered on our warm clothes, then headed out in our boat to find some whales! 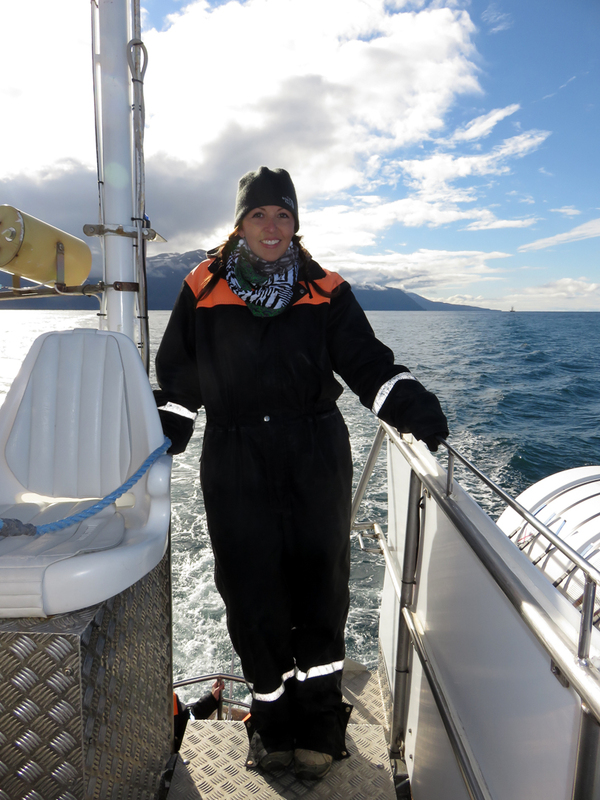 Our guide Sara was fantastic, and within forty minutes we saw our first whale! In total, we saw 6 humpback whales. It was phenomenal to see them come up so close to the boat! 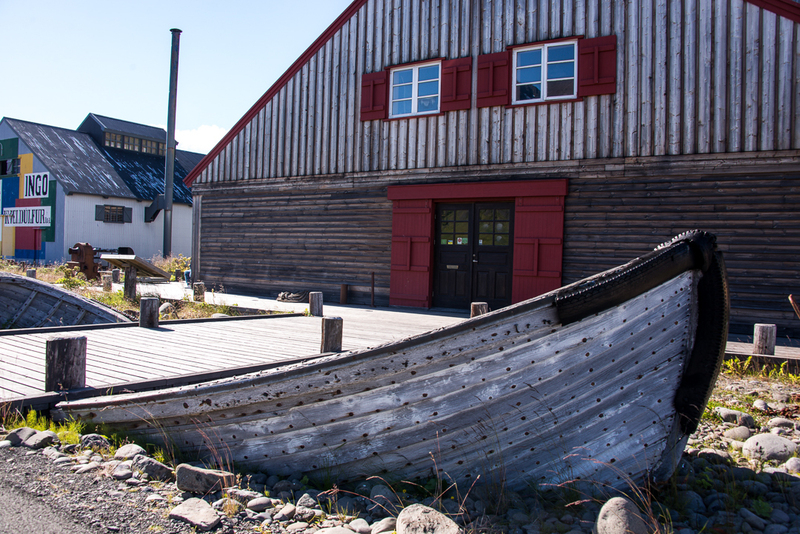 Once you leave Húsavík, drive to the town of Laugar in Reykjadalur for the night. 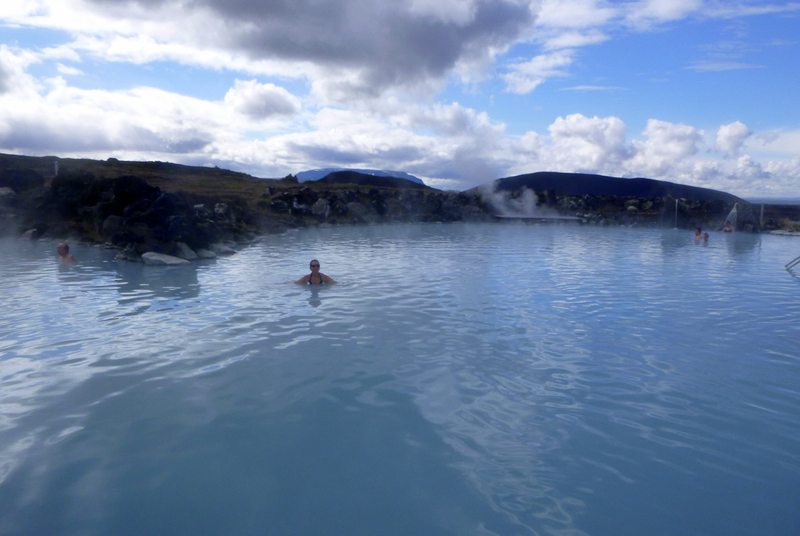 DAY 6: Instead of going to the beautiful but overpriced (and crowded) Blue Lagoon, go instead to the more spacious and even more scenic Mývatn Nature Baths. This place is fantastic! At $38/person it is a steal too! 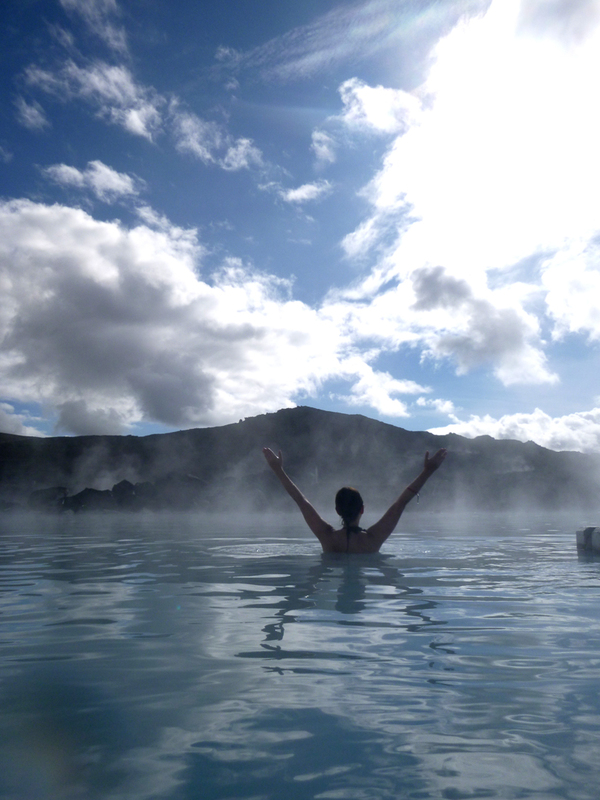 Relax in the soothing thermal waters, surrounded by steam from the local volcanoes. 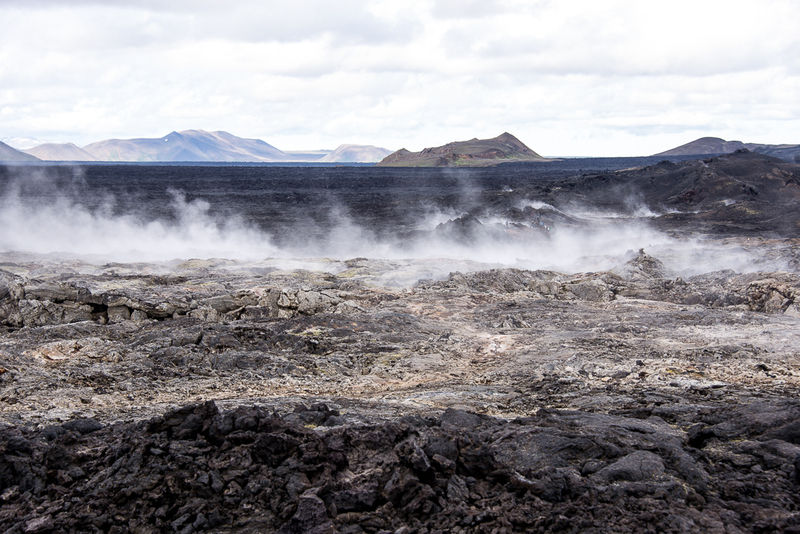 The ominous Krafla Caldera is next on the list. 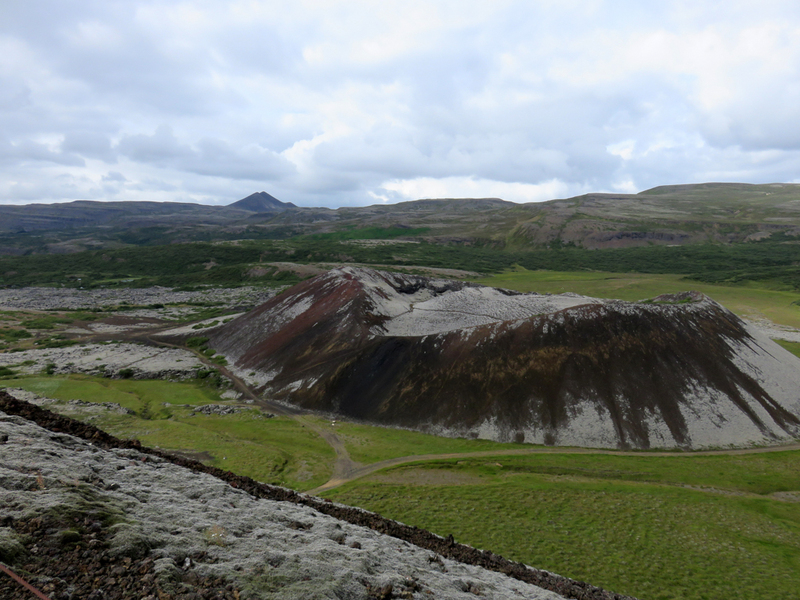 Hike up the rim of the old crater Víti, which was created after the volcanic eruption of Krafla in the year 1724. Go next to the lava field of Leirhnjúkur. This line of black rocks traces what was once the lava flowing out of Krafla Volcano. 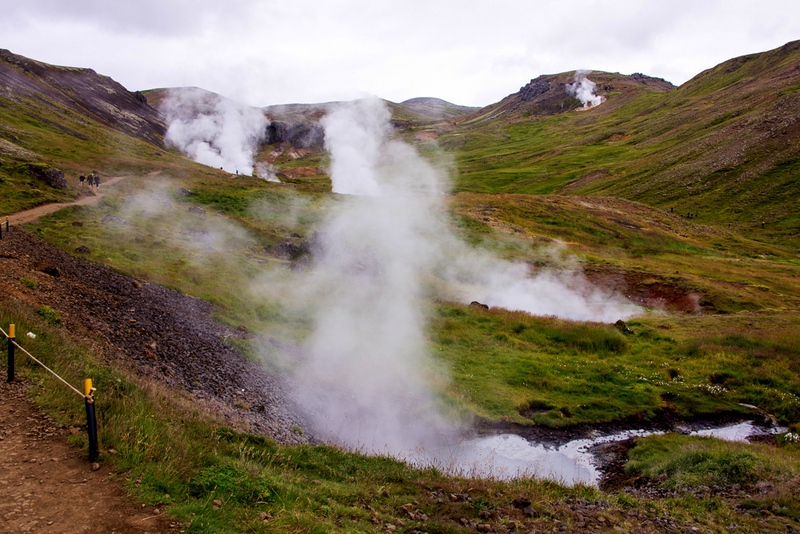 As you hike, you will see many steaming fumaroles, and notice hot spots on the ground. 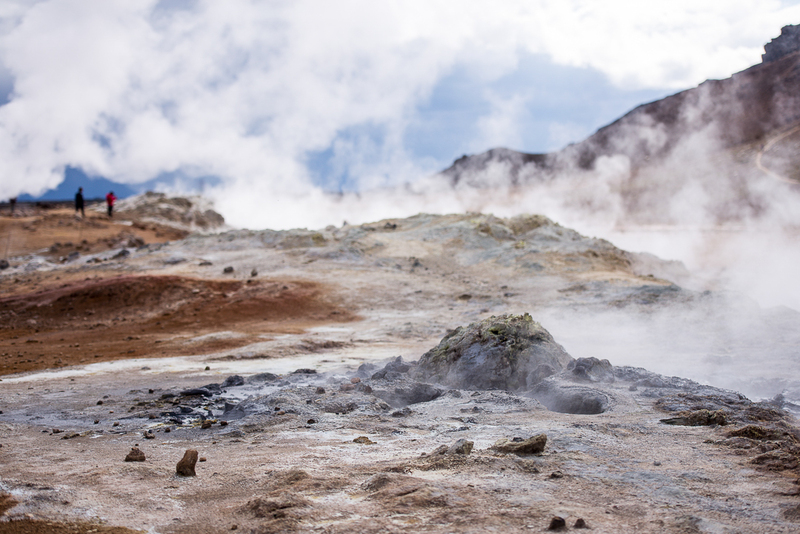 There are several bubbling mud-pots, and vents that shoot out steaming water too. Don’t stray from the trails! 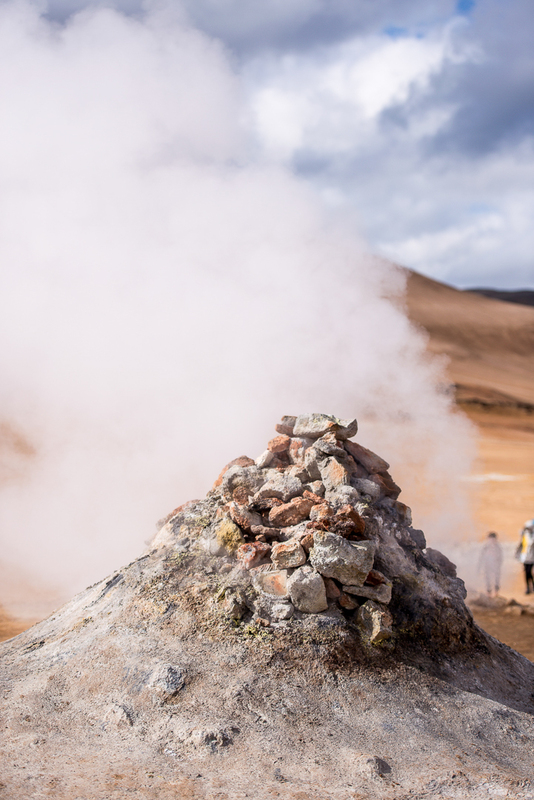 From there, venture to the Hverarönd and Hverir geothermal area. Here you can see gushing, steaming geysers in all their glory- along with their sulfur stench! 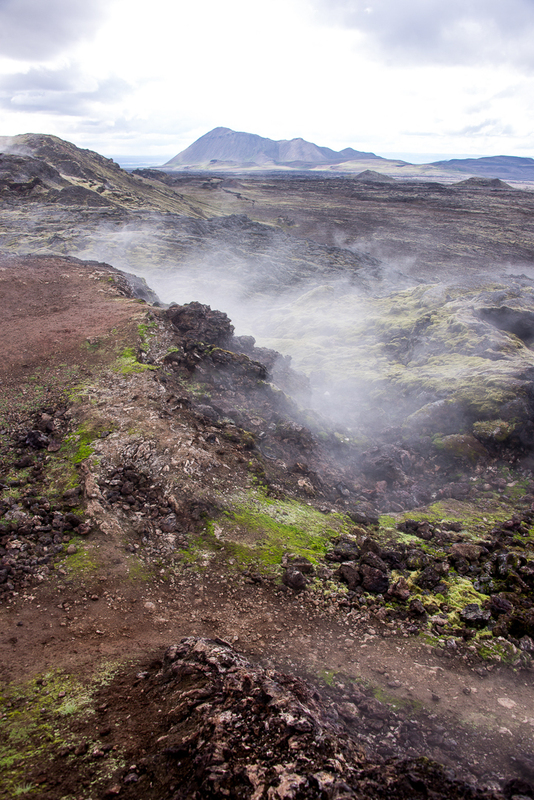 In the surrounding hills, you will see ancient lava trails and smoke seeping out of the ground everywhere you look. After, make a quick stop at the Grjótagjá Cave. It used to be a swim-hole, but after a volcanic eruption in the 1970’s it became too hot to safely swim in and was closed to the general public. It is now mega popular thanks to a Game Of Thrones scene filmed in it. Drive on next to Dimmuborgir, a place known as “The Dark Castles”. Do one of the short loop trails, and notice how eerily silent it is. There are no bugs, no birds, just quiet. It is an unusually shaped lava field, but it looks like an abandoned city. There is also an ancient legend that trolls live here in the many small caves! Afterwards, briefly see the craters at Skútustaðir. 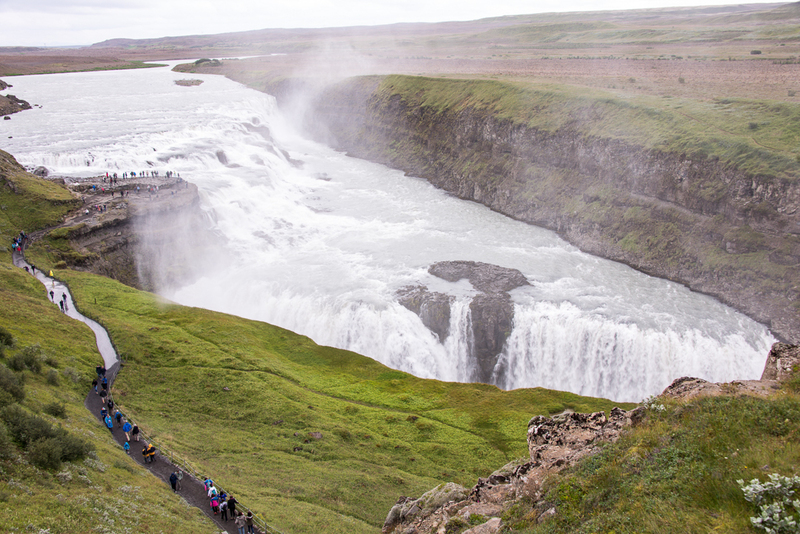 Next, make a stop at the big and wide Goðafoss Waterfall. It’s beautiful, but pales in comparison to what’s next! If your car is capable, take the “F-Road” and drive on the gravel in an isolated part of the country until you reach Aldeyjarfoss Waterfall. Nobody else was there, and it was absolutely unreal! 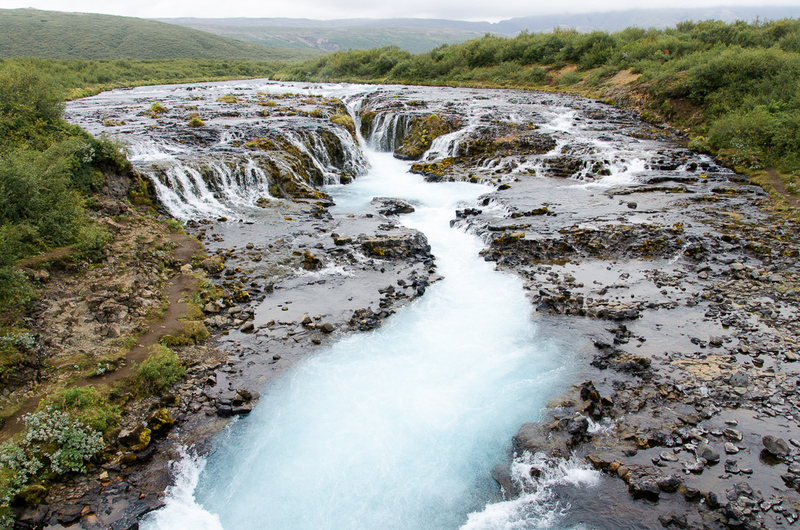 Leave remote Aldeyjarfoss, and drive down to Akureyri, a big town in Icelandic standards. It’s full of charm, and has a big variety of shops and restaurants. 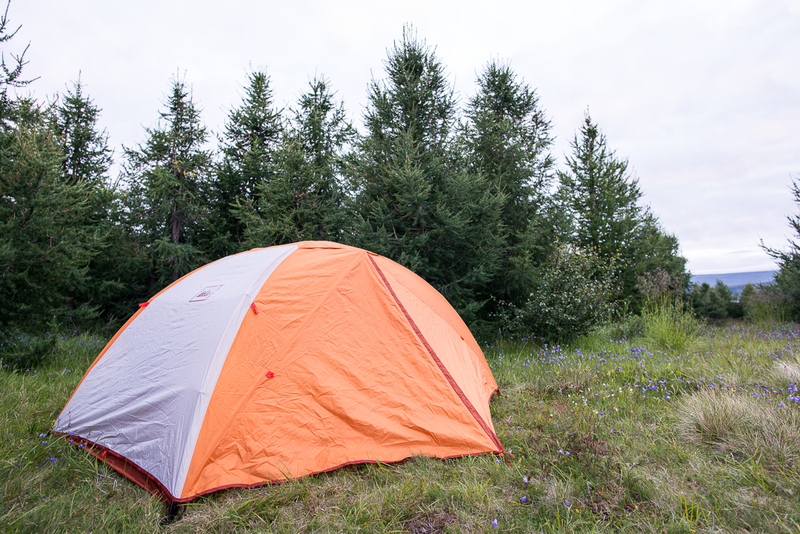 Lodging: Public Campsite: Hamrar – Basic accommodations with showers available. 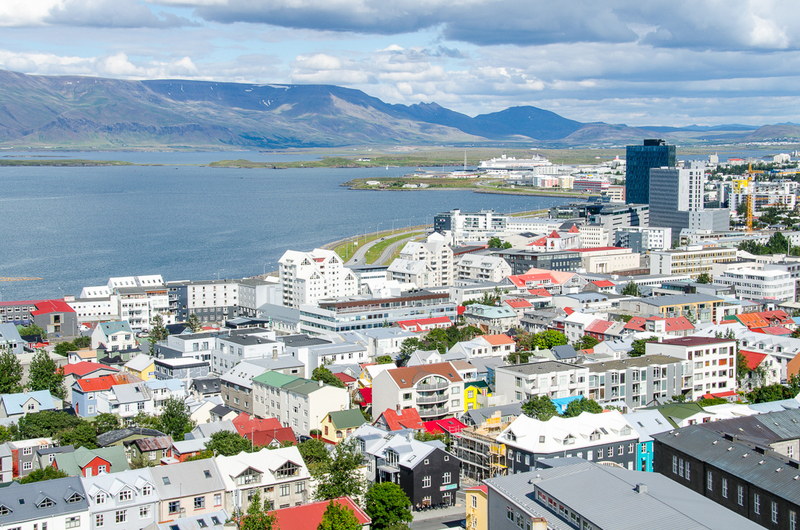 DAY 7: Spend some time exploring and shopping trendy Akureyri. 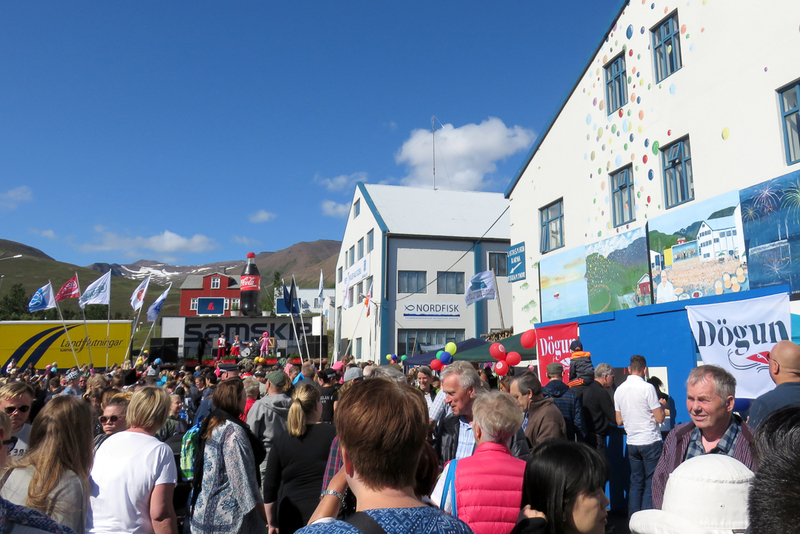 Afterwards, we stopped at a small town called Dalvík for its once-a-year fish festival (but of course this won’t be the case for everyone). It has a photogenic harbor and loads of traditional homes, and we had the chance to try a huge variety of seafood. 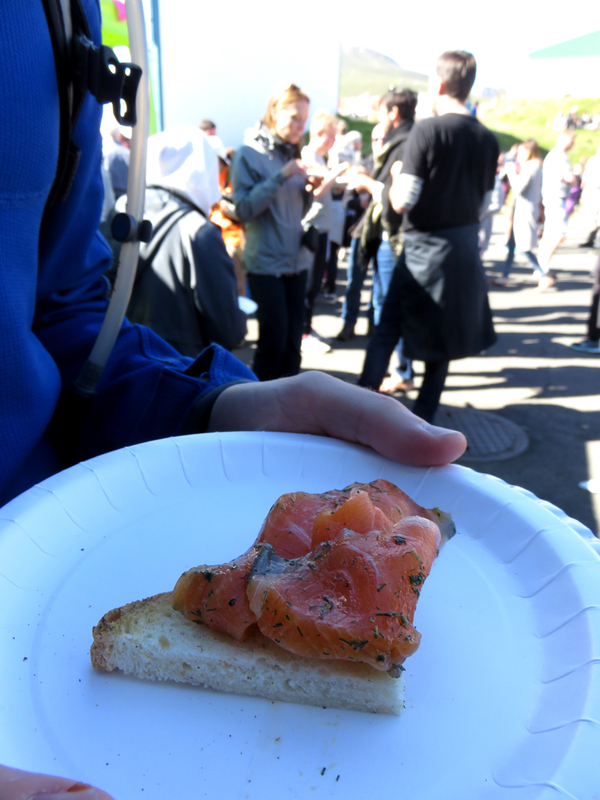 If seafood is your thing, you can find traditional dishes like raw arctic char, and plokkfiskur there. Depart Dalvík, and drive on the Tröllaskagi Road. Full of high cliffs, blue fjords, and epic scenery, this is the part of the road trip to blare some inspirational music! 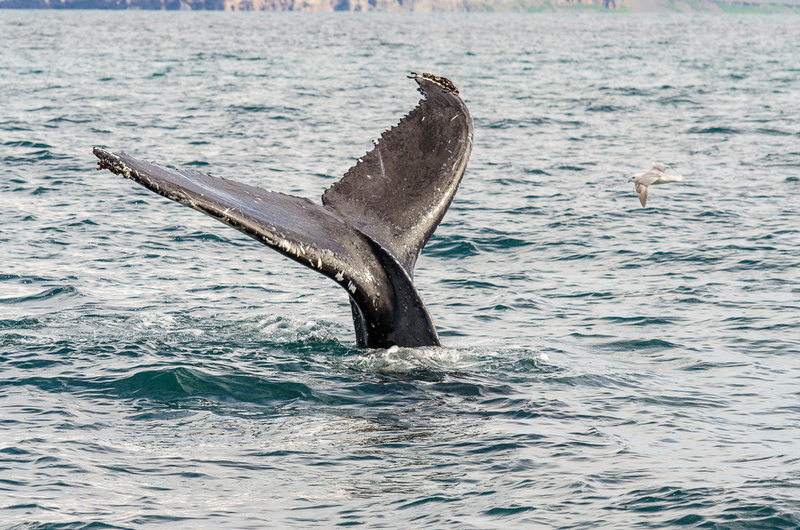 If you watch closely, you might be able to spot some whales out at sea like we did. Also, at some point you will have to go through a crazy, never ending tunnel called Héðinsfjarðargöng, so be prepared! On the drive, pass the town of Olafsfjördur. Eventually arrive to the fishing town of Siglufjördur, a very quiet and isolated place centered around a small marina. We went to the historic Herring Museum and old fish factory there. As you continue the drive, pass by the mounds of Vatnsdalshólar. 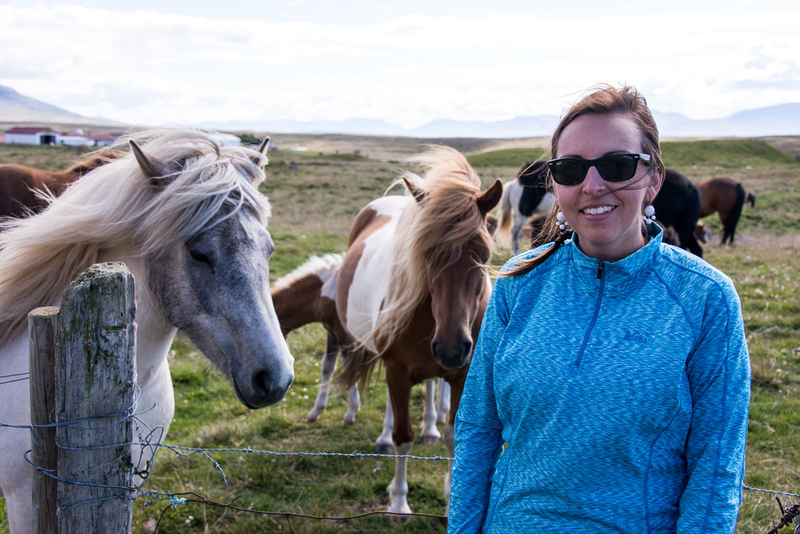 In this area, there are plenty of Icelandic horses too! 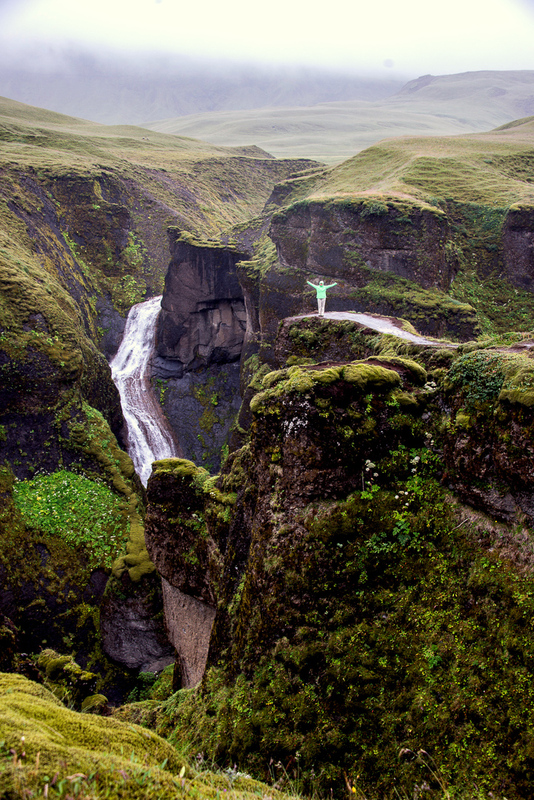 The next stop is the legendary troll cliff of Hvítserkur. It supposedly looks like a troll, and legend says it was frozen in stone for all eternity. It is very scenic, and sits on a black sand beach. For dinner, drive to the town of Hvammstangi. We ate at Hladan Kaffihus– a charming cottage styled place where you can buy owner Maria’s knitted goods, or go out back and check out the whale bones and dried up monster fish (it adds character, you know!). 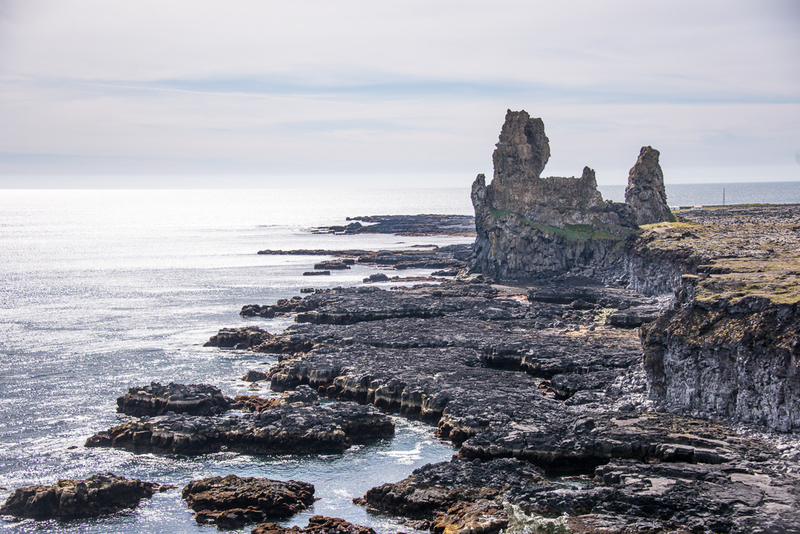 DAY 8: Today is all about exploring the Snæfellsnes Peninsula, so get ready! First, stop at Stykkishólmur town. It has a lighthouse on top of a cliff, and of course a nice view. It’s another typical Icelandic town, but a good representation of the scenery the peninsula is known for! From there, we take the rough F570 road up to see the ancient Songhellir Cave, famous for its echoes. It was a bit of a rough hike, and I fell- so of course only do this hike if you have coordination!! 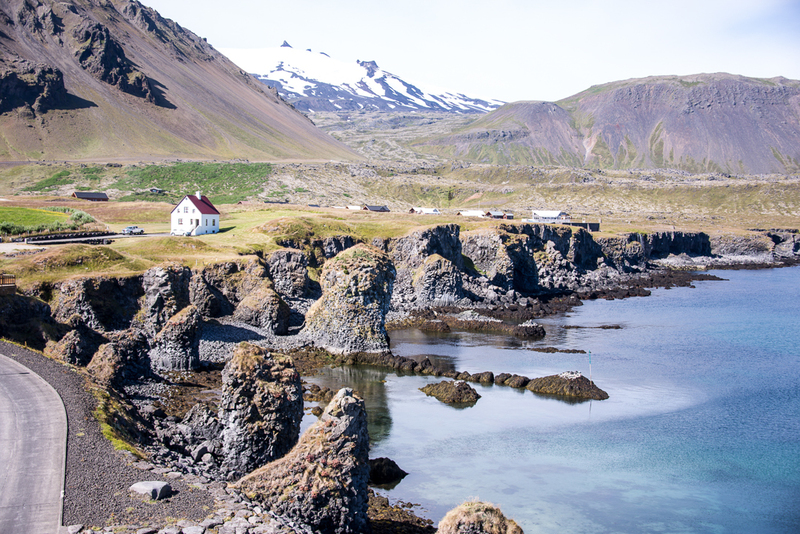 Next, go to the small fishing village of Arnarstapi. It has some incredible cliffs, and a hiking path at the foot of Mount Stapafell if you have the energy! Leave there, and head towards the fishing hamlet of Hellnar. If you want to throw your money away, you can check out the $15 bread and butter plate at Fjöruhúsið (I know Iceland has pricey food for travelers, but this crossed the line!). It was in a scenic spot, sure. But- be smart and use your rented picnic table instead! We had our own meal, with the same view of the bay, but for much cheaper! 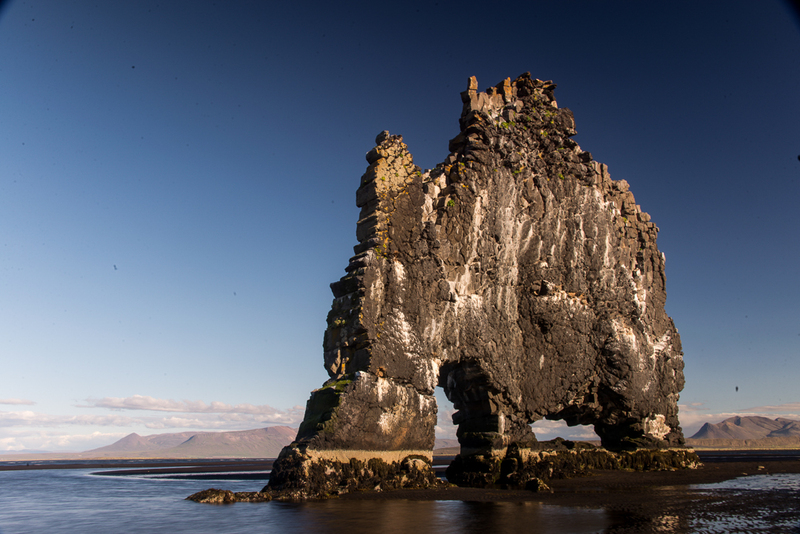 Moving on, make a quick stop at the gravity defying basalt rock pinnacles of Lóndrangar. Then, up next is the site of Djúpalónssandur. Take the hiking path down to the water, and spend time climbing the basalt rock formations. The “sand” in the area is actually smooth, black volcanic rock, so be careful walking! Also, be on the watch for seals swimming around! At this site, there are also the remains of a shipwreck from 1948. Behind that, there are 4 large rocks that comprise part of a centuries old “strength test”. If you have arm muscle, give it a try! From there, drive on to Grundarfjördur town. This is home to the “most photographed site in Iceland”, Kirkjufell. Lodging: Grundarfjördur Hostel – Bunk-beds (no sheets or towels provided) and a shared RR, pricy for what it was. DAY 9: Leave Grundarfjördur and head towards Borgarnes. If you’ve read up on Icelandic folklore, you’ll know about the famous “Saga of Egill”. If you care about Egill like I do, you can stop at the old cemetery of Borg á Myrum. Some of the stones date back to the 12th century, and one of them includes ancient runes. Next, drive to Hvalstöðin, home to the Grabrok Crater and surrounding ancient lava flow. Take the stairs up and hike the rim of the crater. It is definitely a unique experience to look down into an ancient volcano! Make a quick stop next at the incredibly powerful geyser of Deildartunguhver and the attached power plant. Just be prepared, because it is nasty smelling! 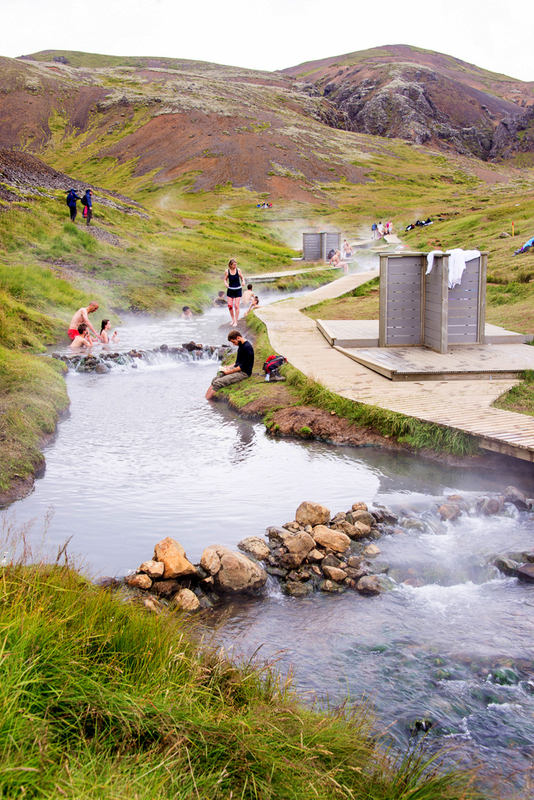 From there, stop in the town of Reykholt, home to an ancient thermal bath from the Icelandic legend “Snorri’s Saga”. We ate lunch by the church, and if you get into Icelandic folklore like me, 😉 make sure to stop at Snorralaug, or “Snorri’s Pool”. Move on next to the two popular waterfalls: Hraunfossar and Barnafoss. 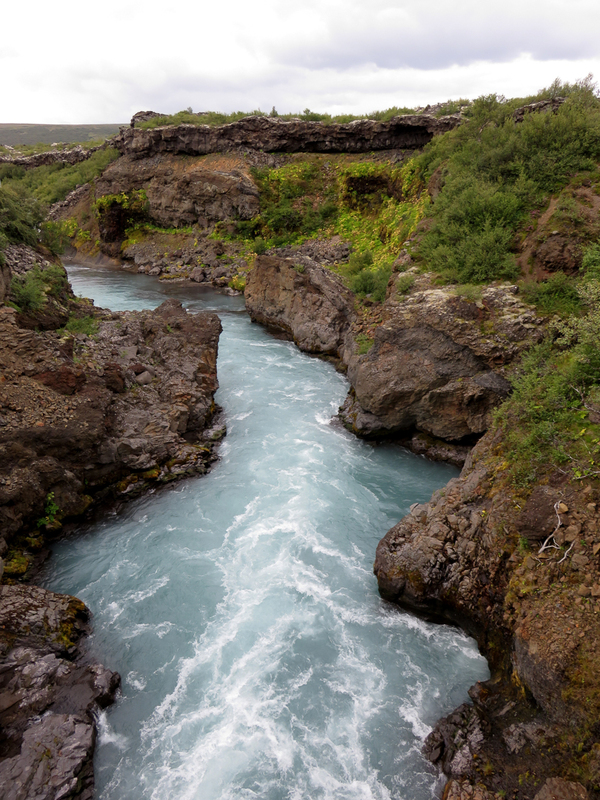 Hraunfossar is huge, very wide, and shockingly blue. Barnafoss is smaller, but still neat to see. 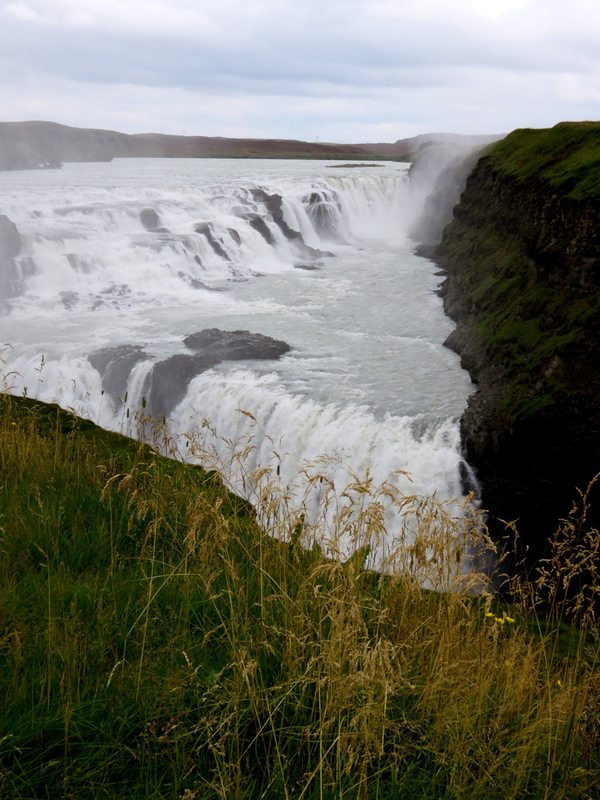 Its name means “The Children’s Falls” after an Icelandic folktale involving two young boys drowning in it. 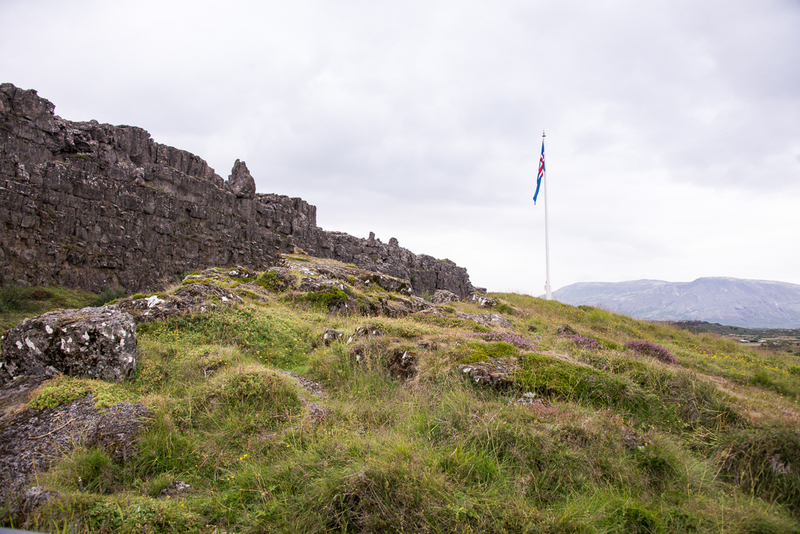 From there, enter the iconic Þinvellir National Park (pronounced Thingvellir). 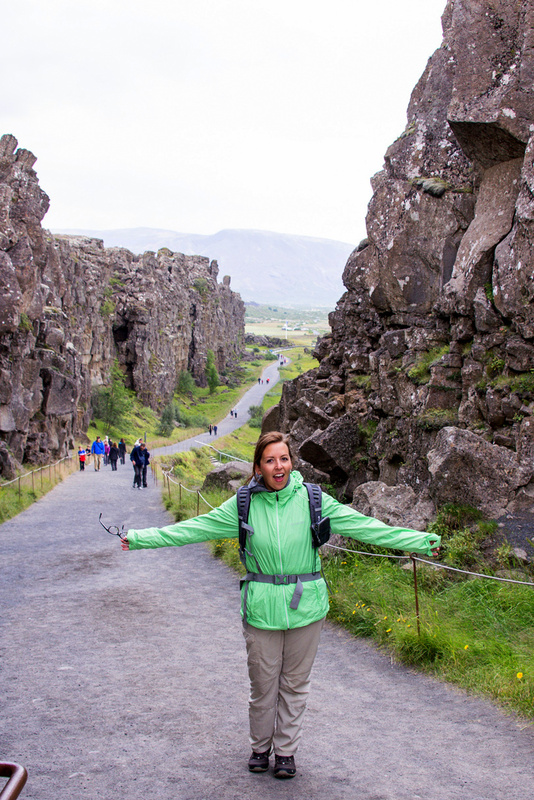 Walk towards the continental rift, and stand on the divide between the Almannagjá tectonic plates. These are what separates Europe from North America! 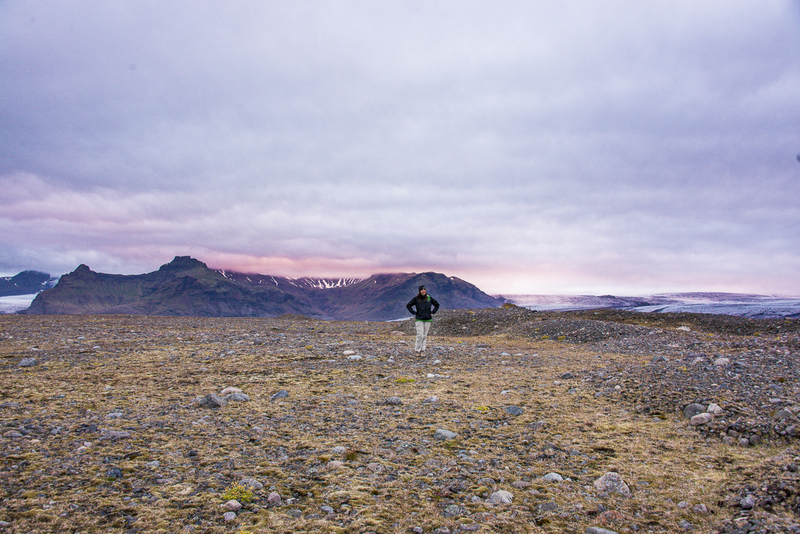 Walk on the trails toward Alþingi, the historic site where the first Icelandic parliament met in 930 AD. 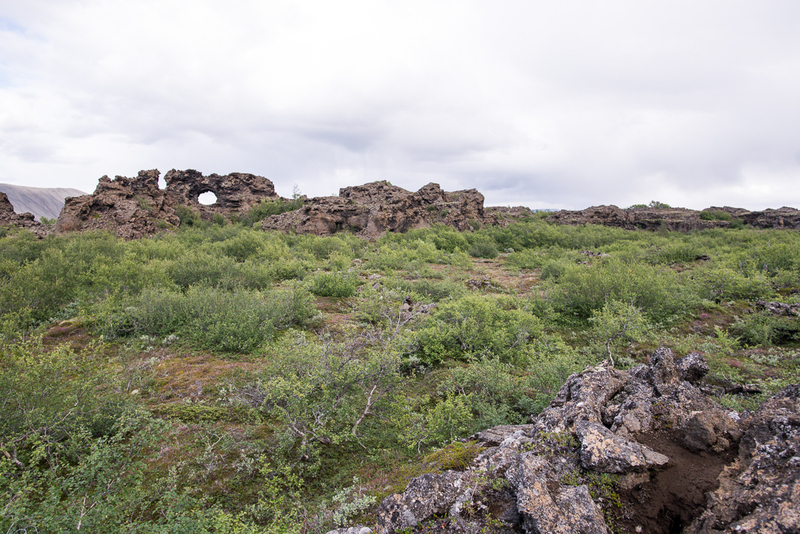 Nearby, you can see the remains of the ancient tent city of Búðir, where the people stayed during these early governmental meetings. 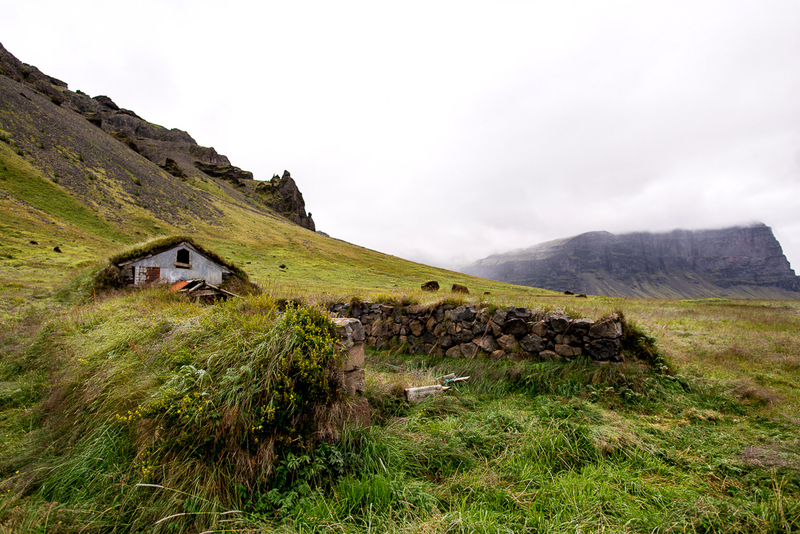 Hike next to the pool of Drekkingarhylur, where people were punished for witchcraft. If they were accused, they faced the fate of being drowned in these pools. Also nearby is the deep, clear, coin-ridden pond of Peningagjá. Oh tourism. Walk next by the Icelandic Prime Minister’s getaway cottage (known as Þingvallabær)! 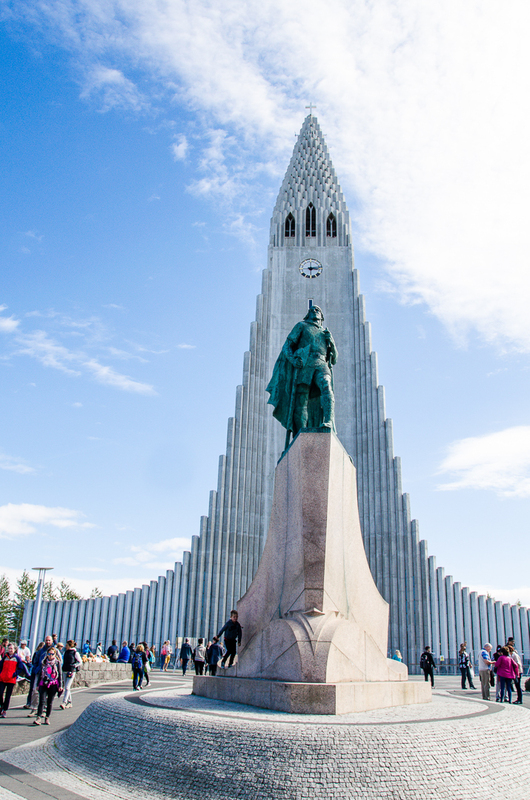 Make a quick stop at the church of þingvallakirkja too. 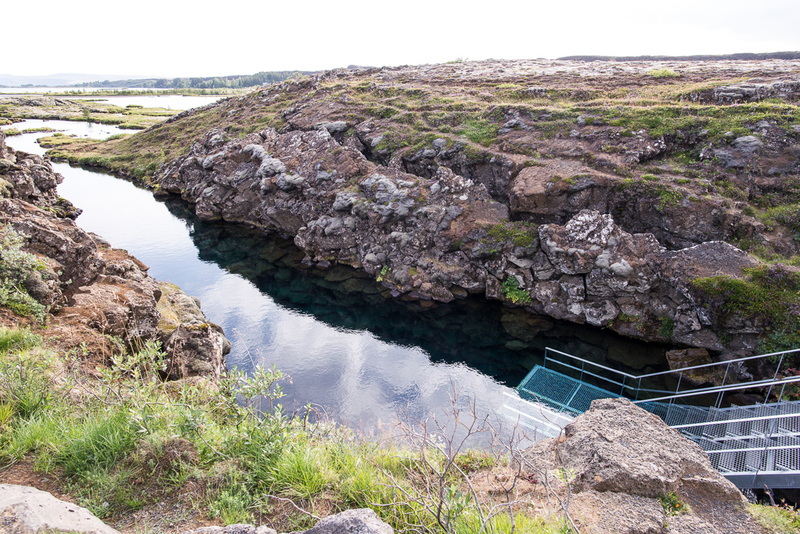 In this area, you will also see the super popular Silfra Fissure. Recently, everyone wants to come here to scuba dive between the continental plates. Next, head to the town of Akranes for the night. 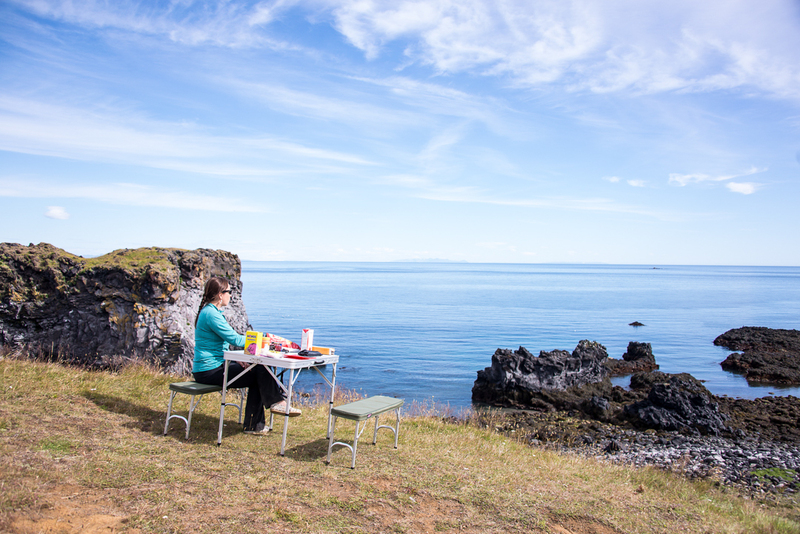 Lodging: Wild-Camping on an isolated hillside overlooking þingvellir below. Watch out for the sheep! 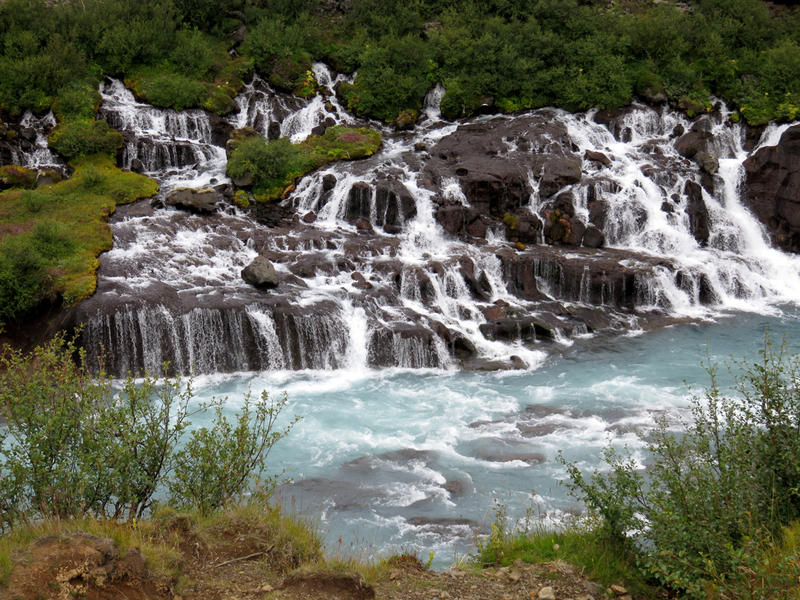 DAY 10: Today, start out by hunting for the elusive Brúarfoss Waterfall. We read several blogs with detailed instructions on how to find it, but it was still a struggle. We almost gave up, but with some last minute luck, we found it! We were the only people there, and while it is small it is also an incredible and vivid shade of blue. I highly recommend! 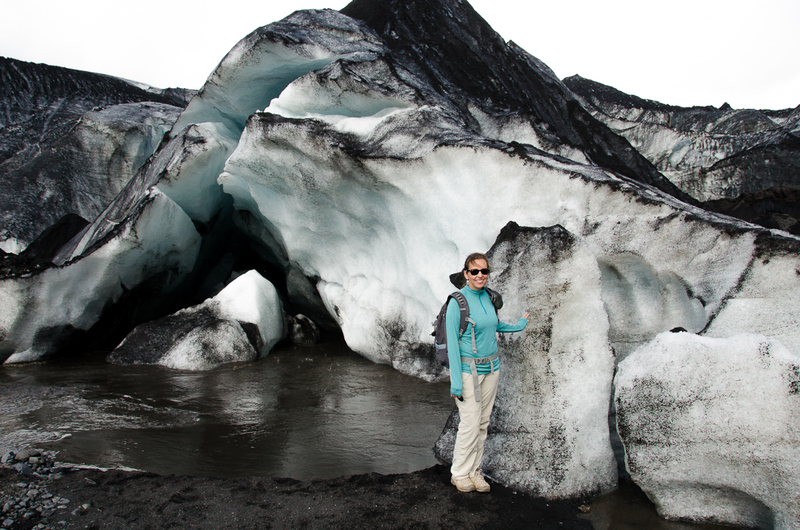 Finally, it is time to finish your visit to the 3 tourist sites known as Iceland’s Golden Circle. First up was þingvellir, from yesterday.. Second, head to the crowded Gullfoss Waterfall. It is huge and powerful, so worth a stop- but not nearly as peaceful or remote as others. Drive next to the site of Geysir (pronounced gay-zeer), the original hot water spout which all future geysers derive their names from. The geyser Strokkur erupts every 5-10 minutes, and is truly amazing to see. 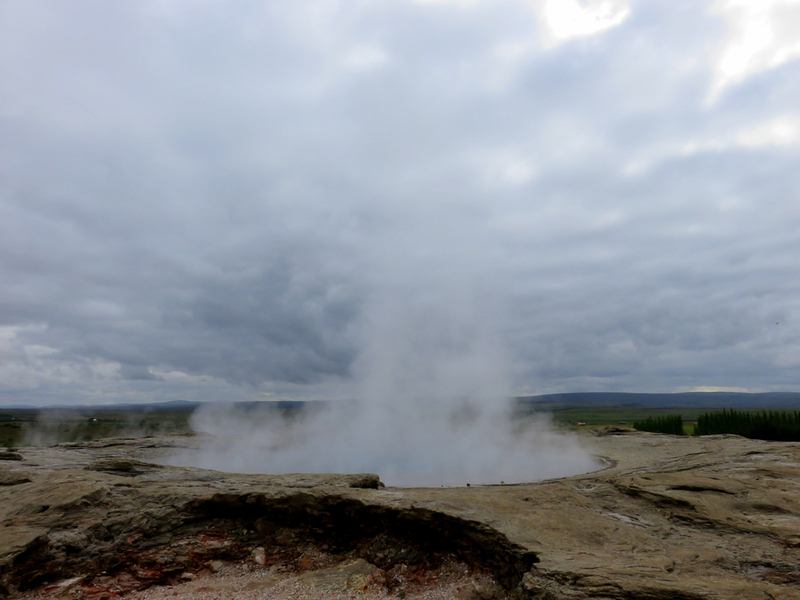 The main geyser, or “Geysir”, had been essentially dormant for the past 100 years, but recently blew in February 2016. It is rare to see it blow, and is now basically considered inactive. With that, you’ve completed the 3 Golden Circle sites! Faxi Waterfall is a nearby place where we had lunch. Nobody else was there, so I recommend it if you want some peace and quiet! Afterwards, drive past Hellisheiðarvirkjun, an enormous geothermal power plant. 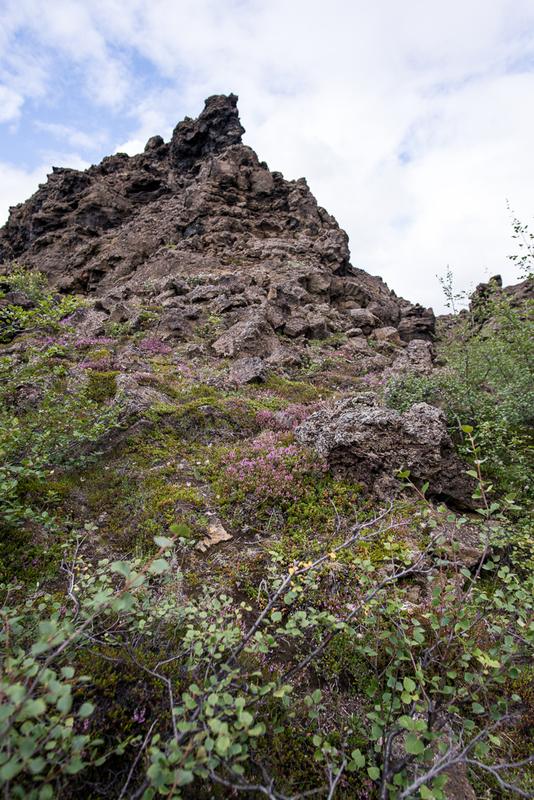 If you like hiking, take the long uphill trek (along with evil biting flies) to the site of the Reykjadalur Hot Spring. A beautiful, geothermal valley famous for its “hot river”, here you can have a relaxing yet muddy swim in the long and winding creek. On the hike down, we walked past a small geyser, and I was sprayed with hot sulfuric water- so be careful! Finally, end your trip in the city of Reykjavík! Lodging: Hotel Keflavík: Closet size room with shared bathroom facilities by the airport. We rented our car from Sad Cars, and I highly recommend! For day trip ideas, please consider booking from my Affiliate site on Viator, help a girl out! As always, all reviews and opinions are my own. However, I may receive a small commission should you choose to book any of the Iceland hotels or tours listed above. This helps with the costs of running this site. I adore Iceland but only got to spend a couple of days there. Your itinerary sounds amazing, and I’m saving it for a time when I get to spend longer there. Isn’t it just the most gorgeous landscape?! Iceland is such an amazing destination full of some of the most amazing sites. We spent 4 days in Iceland in January and loved it. We spent a day driving to Vek and seeing all the amazing sites in between. I’d love to go back in winter, I’m sure it’s an entirely different world than what I saw in the summertime! Wow, you were lucky to travel all the country. I been wanting to go to Iceland but the exchange rate is too expensive for Canadians. I really love your pictures! 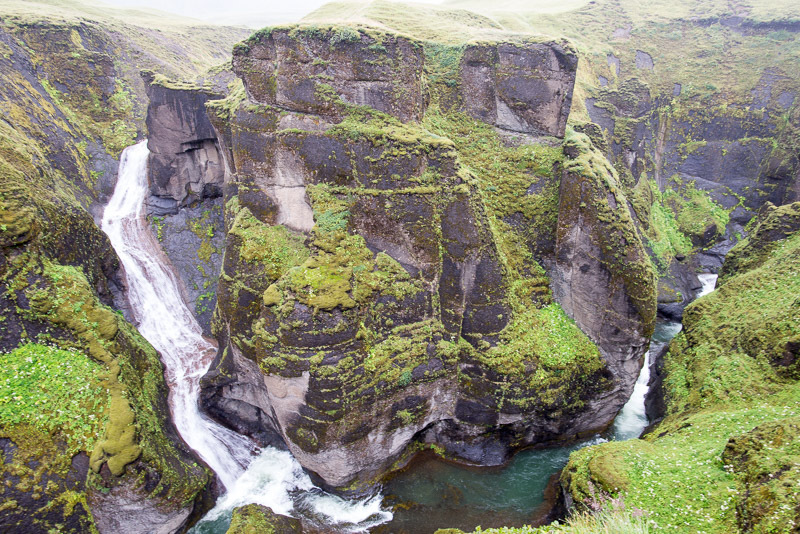 Fjaðrárgljúfur Canyon looks absolutely beautiful! It was definitely quite pricy for us as Americans too! A gas station hotdog ran us about $10US which would buy me 10 here for example! We saved money by wild-camping though, which is nice that they have that option! Iceland has such beautiful landscape. It is so cool to see glacier up close. 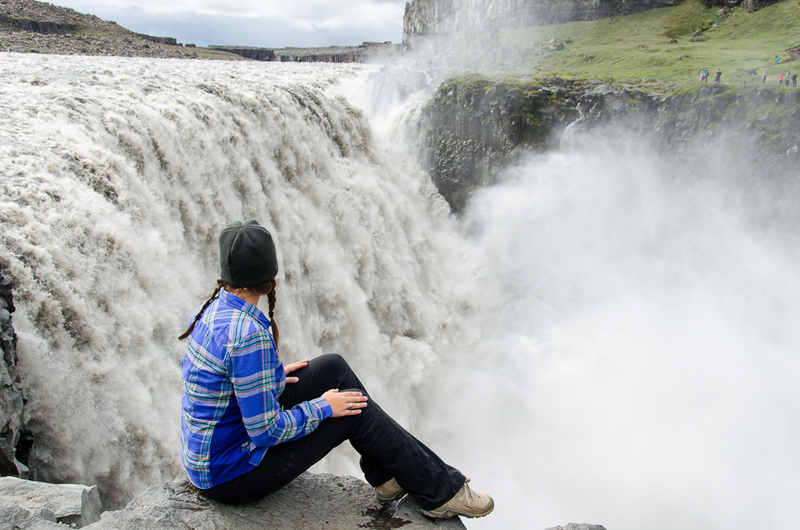 I’d totally be up to hike to the top of Dettifoss Waterfall! Very well done! So many people are writing about Iceland, but generally the articles leave me pretty unsatisfied, with many questions unanswered. You covered all the bases. Awesome! I’ve always wanted to go to Iceland and this trip looks amazing! Coming from New Zealand I’m used to things being more expensive than in other countries, but it looks like Iceland might have New Zealand beat on that one. $15 for a hot dog?! Being able to camp freely must have been a great way to save some money though. I’m guessing there are times of the year when it must be too cold to camp, is there a best time to go? Maybe when it’s not too overcrowded with tourists, but not too cold either? Definitely adding this trip to my list of places to go! Did you use many F Roads? What kind of car would you recommend hiring to optimize our experience in Iceland?